After that visit in Bhaktapur City, Pradeep lead me to this small pond, a 5 minute drive on which I also saw some tourists and locals. There is no entrance fee, Pradeep bought something and it was actually some crackers or foods for fish. So we seated in an area and threw some of it and the fishes came to us and it was fun seeing those things fighting for foods. It was actually a short rest then we headed directly to a small restaurant where we had our lunch. 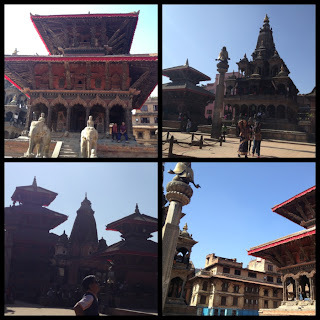 Our next destination was the Durbar Square. It was mostly like a sightseeing tour where its old temples and palaces epitomize the religious and cultural life of the people. It is situated in front of the old royal palace and also a UNESCO World Heritage site. I was talking to Pradeep when someone approached us and asked for tourist ID. She heard us speaking in English (a big mistake) so it meant that I'm a tourist and entrance fee with ID is a must. I insisted that I won't pay and besides I already took some pictures so we just left the place. We then roamed the area and found some souvenir shops where I bought some miniature temples. It is actually a big area. We left the place after almost an hour. Swayambhunath Stupa was our last stop and is one of the most popular and instantly recognizable symbols of Nepal. It is perched atop a hill on the western edge of the Kathmandu valley. It is also known as the Monkey Temple since there are holy monkeys living in the northwest parts of the temple. It is again an uphill climb and must take the stairs to reach the top. It was kind of the same of Boudhanath, only smaller. 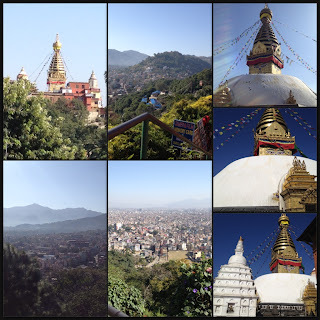 The central buildings and decorations of Swayambhunath are rich with Buddhist symbolism. The white washed dome of the main stupa represents the womb of creation. From that place, you can see almost the entire Kathmandu, it was a picturesque scene. Overall, though the trip was brief, I still enjoyed it and for me, experiencing other cultures is the most important thing. Next thing is probably the spots and its history. Nepal is a beautiful country but it still needs to improve itself and provide better living to its residents. Pradeep told me that their country is "devlack" (I thought it was deadlock) meaning they are lacking of developments since the government isn't doing its best to prosper the country. 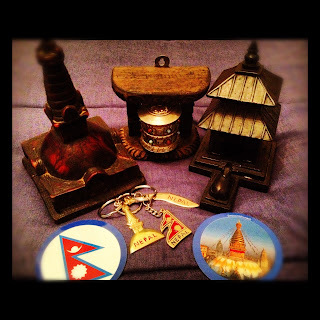 Souvenirs that I bought will remind me the simple life they have in Nepal and its rich history and the religion that covers them enriching their faith. I will definitely come back to this country.